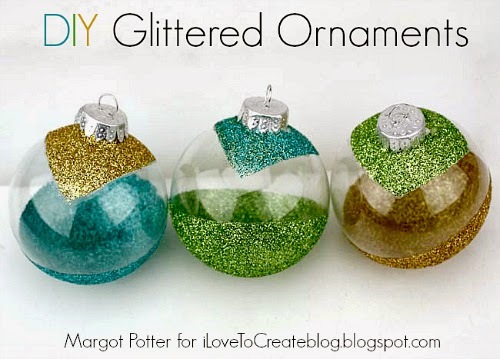 I love the look of glittered ornaments, but I wanted to do something a little different and create areas of glitter and areas of clear glass for a very modern take on a vintage look. 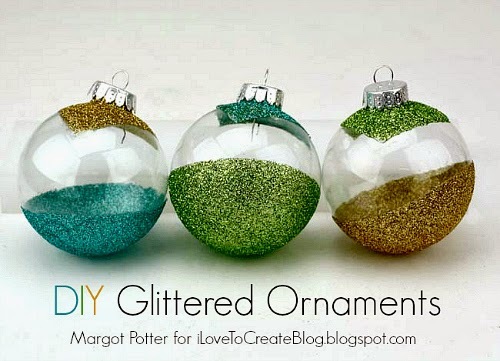 Painter's tape, Aleene's Super Thick Tacky Glue and Tulip Fabric Glitter made it easy to give inexpensive clear ornaments an upscale glam appeal. 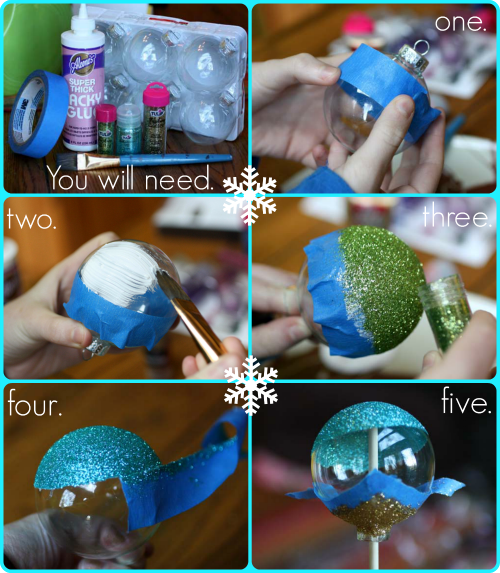 Step One: Use painter's tape to mask off an angled section at the bottom of each ornament. Take the time to run your fingernails across the edge of the paint to be sure it's sealed and any bubbles are pressed out. Step Two: Squeeze out some glue and use a big paintbrush to generously coat the bottom half of the ornament up to the painter's tape. Tape Three: Sprinkle glitter over glue. Step Four: Remove tape from ornament before glue dries. This will prevent seepage and allow you to clean up the line with a wet paper towel so it's clean and glue free. Allow this to dry for a few hours before the next step. You can slide the ornaments on some wooden dowels and put them into foam while drying. Step five: Remove the ornament topper. Tape off a triangular area around the top of the ornament. I used three pieces of painter's tape. Repeat first four steps as before. That's it! These can be done in all sorts of color combinations. You could add stripes, a grid, color blocked sections or a third geometric color area. It's totally up to you. I can't wait to put these on our Christmas tree! For more creative inspiration, join the conversation on Facebook. Visit The Impatient Crafter for more fun, fast and fabulous DIY! Love it! Excellent work as always!